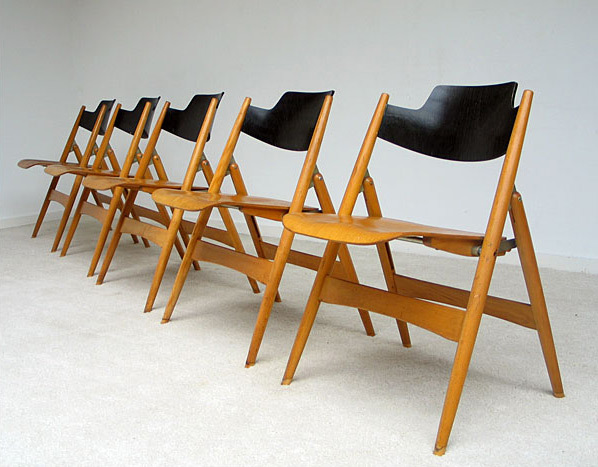 5 Folding chairs, Model SE 18, designed by Egon Eiermann, 1952, manufactured by Wilde & Spieth, Germany, solid natural beechwood, backrest of dark stained beechwood veneer, metal stretchers. Received the price for 'Good Design' Museum of Modern Art, New York. 5 chaises, Modèle SE 18 conçu par Egon Eiermann en 1952 pour Wilde & Spieth, Allemagne, fabrique en bois de hêtre. Le modèle SE 18 de Eiermann a reçu le prix de 'Bonne Conception' du musée d'art Moderne, New York.